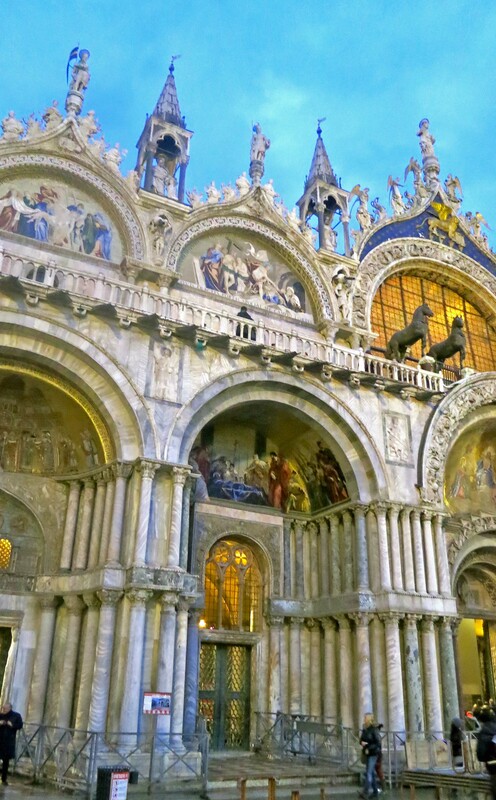 St. Mark’s Basilica is a beautiful church that dominates St. Marks Square in Venice. Being eager to begin our exploration of Venice we picked up a water taxi from the cruise port. It retraced our earlier route from a sea-level perspective and deposited us near a large statue of Victor Emmanuel. He served as the first king of Italy when the various Italian city-states were united in the mid 1800s. 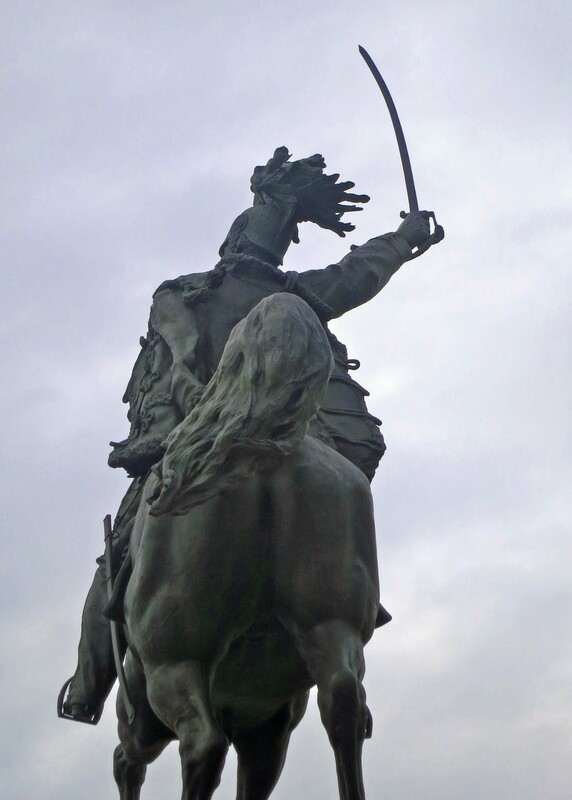 I took this photo of King Emmanuel charging into battle with his sword raised and horse’s tail flying. 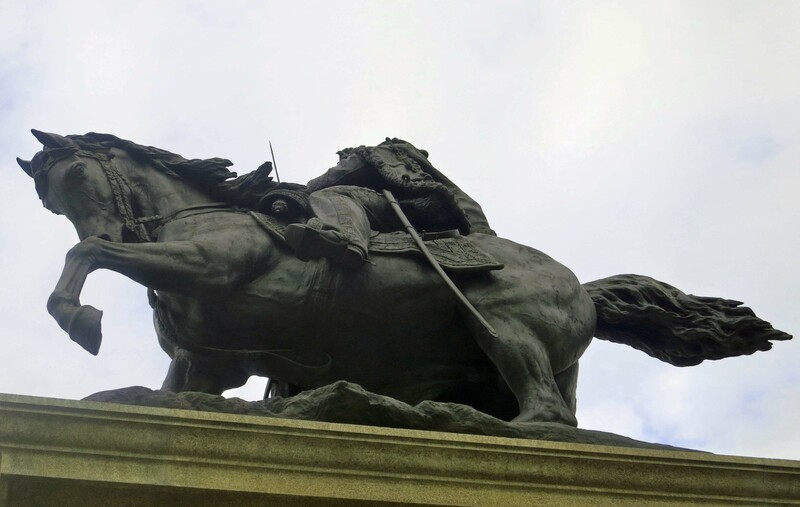 Another photo of Emmanuel’s imposing horse in the waterfront monument in Venice. 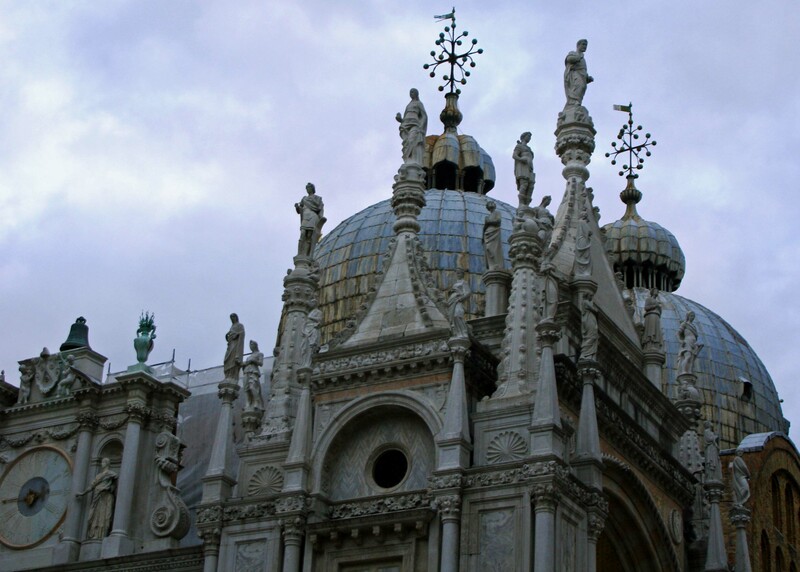 In addition to an imposing horse and Victor, the statue features Venice, represented as a woman, and St. Mark, represented as a winged lion, book-ending the monument. 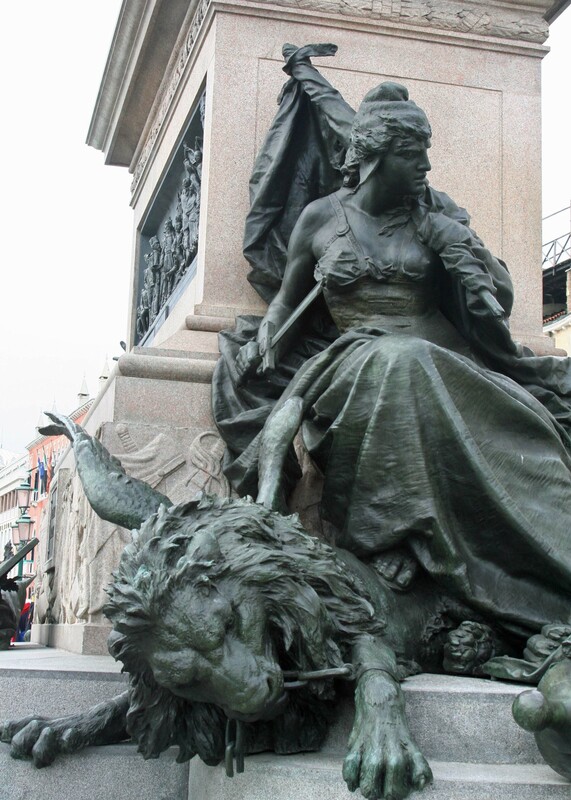 On one end, the lion bites through the chains of Austrian oppression while Venice looks on in a tattered dress with one breast hanging out; on the other end he roars in victory and Venice is fully clothed in an expensive dress. 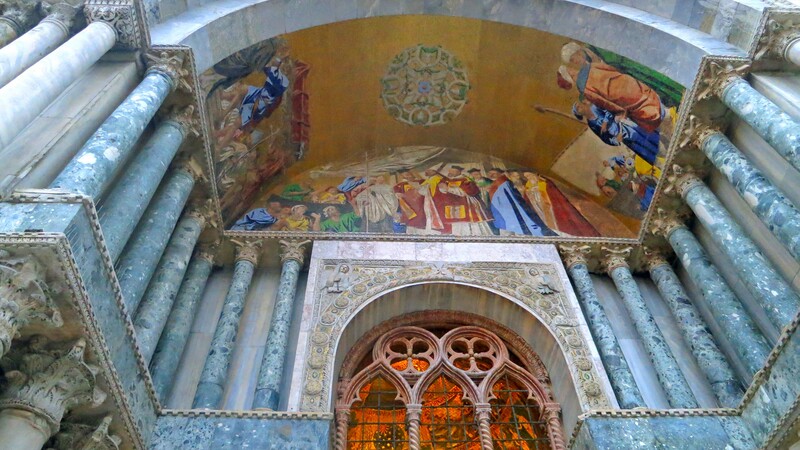 St. Mark, with his representational lion, is the protector of Venice. The lion can be found almost everywhere. Mark, of Matthew, Mark, Luke and John, supposedly came through the region when it was a swamp and gave his blessing. This justified two Venetian merchants turning into grave robbers and stealing the body from Alexandria in 828 AD. They slipped Mark into a pork barrel for transport. Moslems consider pork unclean so the barrel was unlikely to be checked by the local officials. Mark made it safely to Venice in his smelly container, was presented to the Doge of Venice, and was subsequently buried under what would become St. Mark’s Basilica located on St. Mark’s Square, which was our objective for the day. Along the way we would pass by the Bridge of Sighs and the Doge’s Palace. We would also walk on water. Actually we walked on tables that are placed in the square to help people avoid the Adriatic Sea, which is a regular visitor. Between Venice sinking some nine inches per century, high tides, and global warming, floods have become a serious problem for the city. 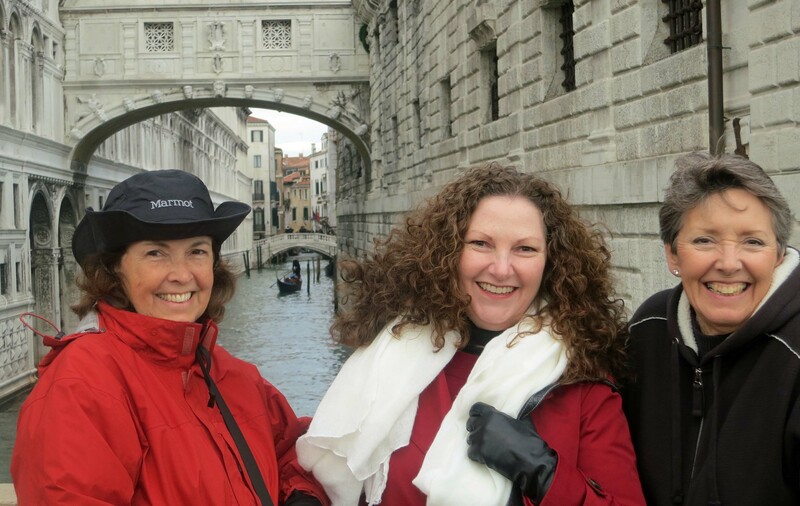 Peggy, Kathi Saage and Frances Dallen pose in front of the Bridge of Sighs. They aren’t sighing but they are cold. A gondolier lurks in the background. I suspect he was cold as well. 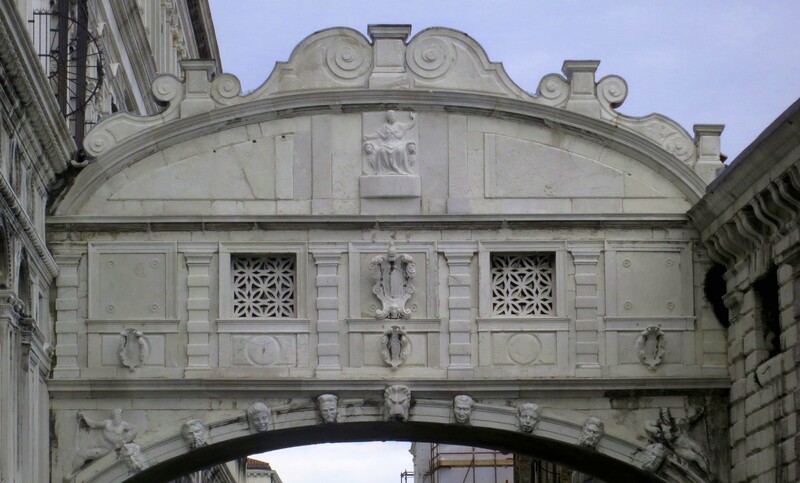 The Bridge of Sighs was so named because prisoners, condemned in the Doge’s Palace, could have their last look at freedom as they crossed the bridge from the Palace to the prison. Supposedly they sighed. It took a poet, Lord Byron, to give the bridge its name. 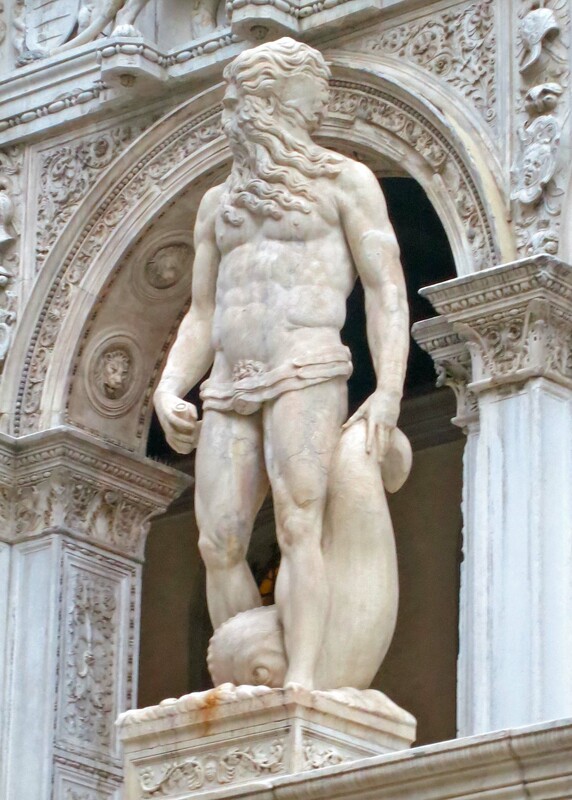 A rather furry Neptune, symbol of Venice’s sea power, welcomes visitors to the Doge’s Palace. 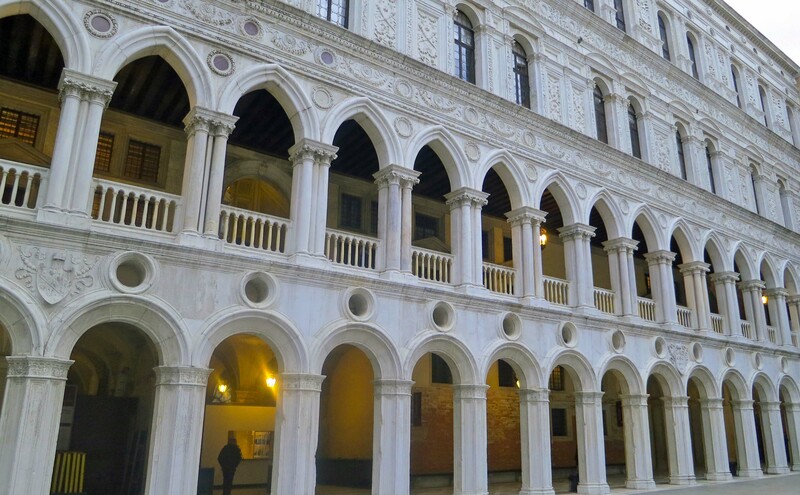 A view of the inner courtyard of the Doge’s Palace in Venice. 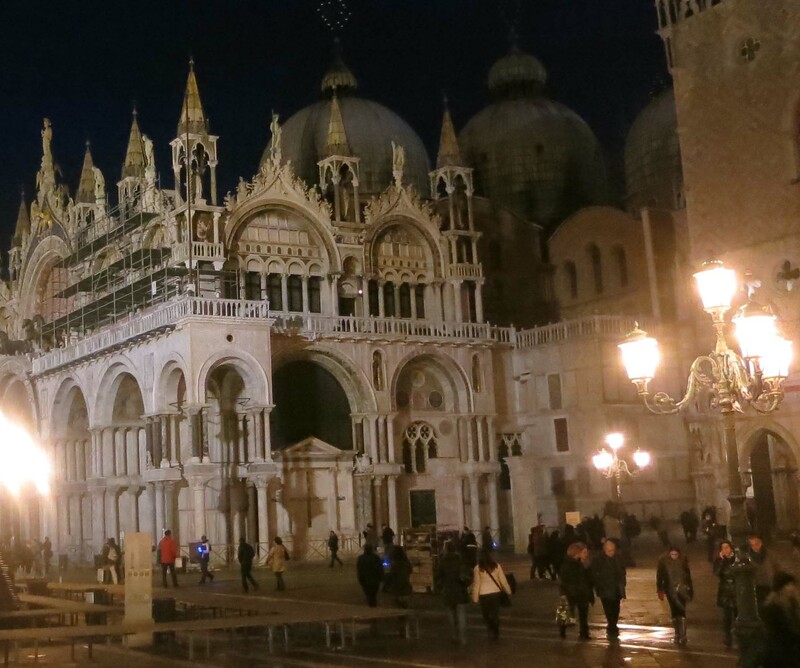 St. Mark’s Basilica and street lamps by night. 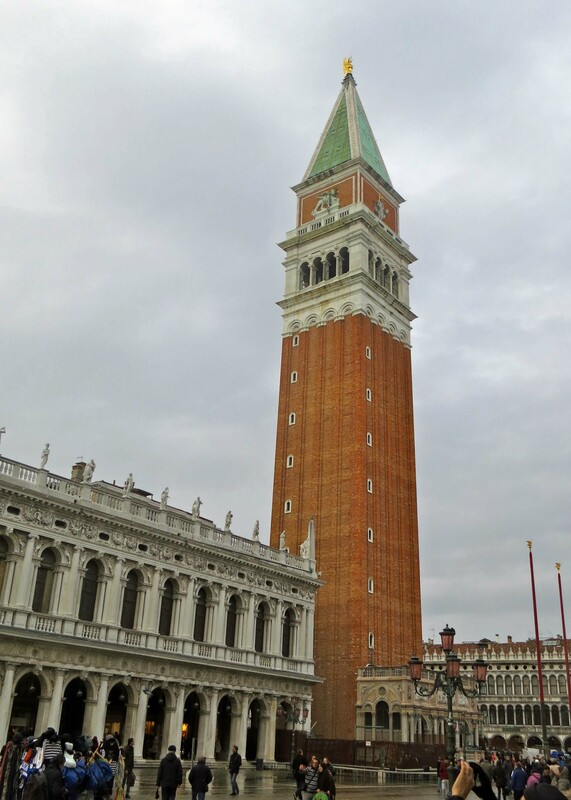 The Campanile is a prominent St. Mark’s Square and Venice landmark. In 1902 it came tumbling down and had to be replaced. 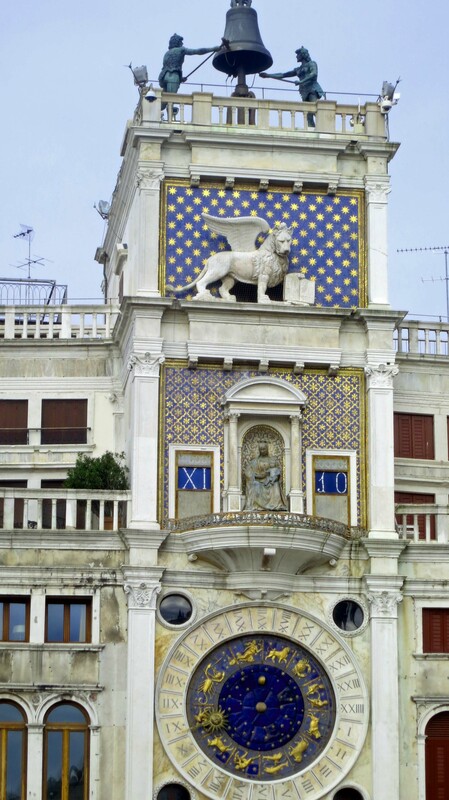 This clock tower is another well-known land mark in St. Mark’s Square. Note the winged lion and the digital clock with Roman Numerals. The bronze bell ringers on top and the astrological clock at the bottom are also impressive. As I mentioned, Venice is subject to frequent floods. Global warming has added to this problem. 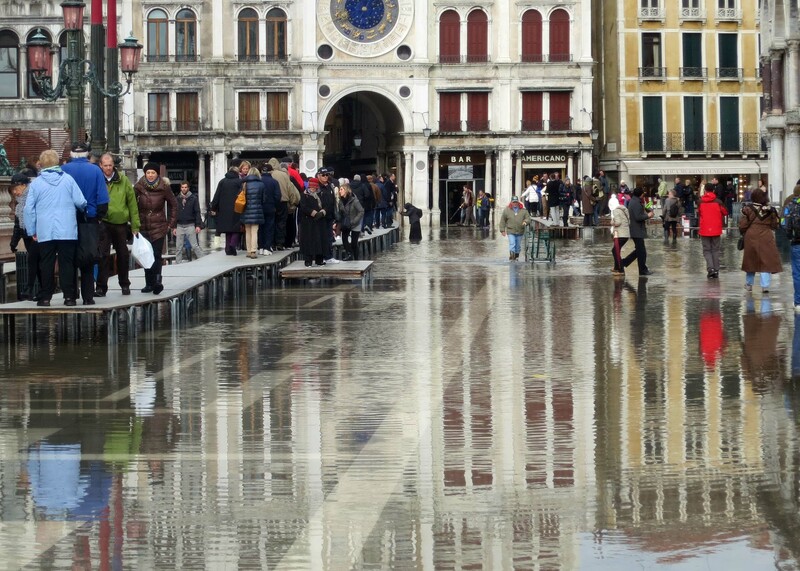 This shot, taken just below the Clock Tower in St. Mark’s Square, shows people using the table walkways and walking through the water. 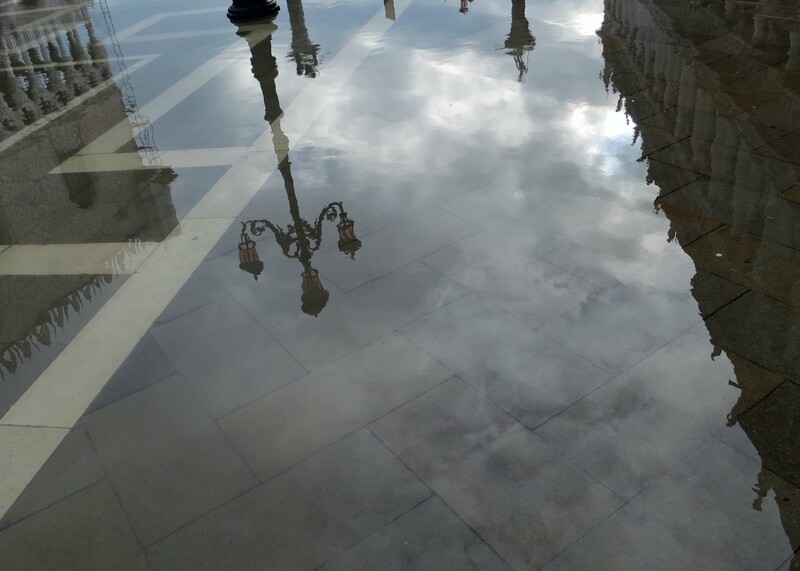 I’ll close with this flood photo I took in St. Mark’s Square that reflects both lamp posts and walls located in the Square. NEXT BLOG: The striking and practical canals of Venice. Your first photo opening this informative blog was spectacular. 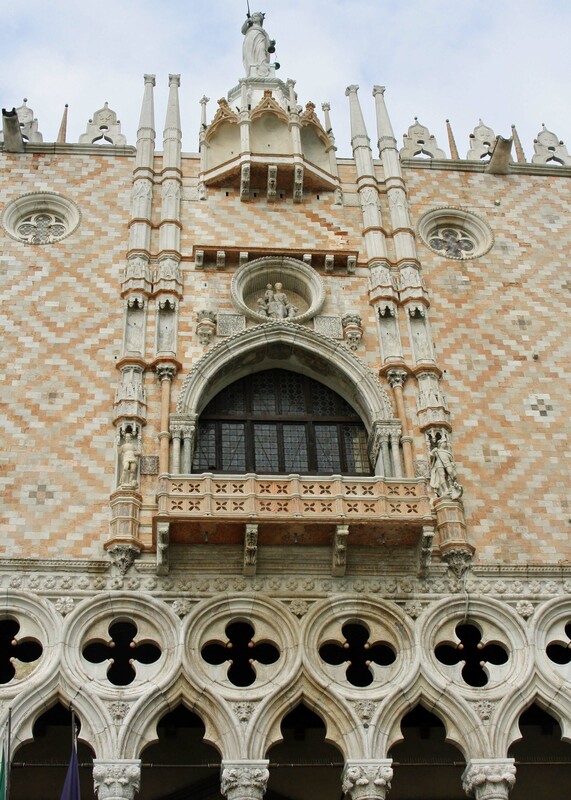 The colors, richness and textures are deep… I have seen photos of the sea level rising and flooding Venice. I would be curious to know how the merchants and restaurants can stay in business…isn’t the water commingled with the water from the canal? Drinking water comes in from an aqueduct coming down from the mountains, Koji. There is no sewer smell so Venice must do a good job with its waste water. A new gate system is being created to automatically go up when water is high. It will be interesting to see if it works. As for the canals, they have always opened to the sea. And thanks for your comment on the photo. Ok, I am now convinced I must start making a plan to visit Europe and definitely include Venice in the trip..The pictures you took are amazing and the smiles on the pretty ladies faces tells me all I need to know..A great time is had by all in Venice!! While I have been in Europe a few times over the years, Lynne, I was intrigued by the list of cities that were included on the cruise itinerary when my brother-in-law asked if we would like to join him. Most of the cities were places I hadn’t been. We jumped on the opportunity even though cruising isn’t my preferred mode of travel. It has been fun sharing our experiences.